In the spirit of St. Patrick's Day (a.k.a. 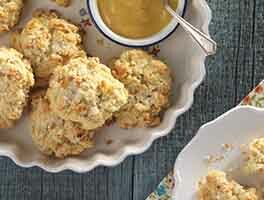 the Feast of St. Patrick), these scones celebrate all things Irish. They feature our Irish-style wholemeal flour for that extra-tender, soda bread-like texture, and their flavor evokes a hot mug of cappuccino infused with Irish cream liqueur. To make the scones: Preheat the oven to 425°F with a rack in the upper third. Line a baking sheet with parchment; or lightly grease it. Combine the flours, baking powder, sugar, and salt. Work the butter into the flour mixture until unevenly crumbly; you'll want to see some larger, pea-sized pieces of butter. Toss in the butterscotch chips, if using. Mix together the egg, liqueur, milk, and flavor, and add to the flour-butter mixture, stirring until the dough is evenly moistened and holds together. Drop the dough by 1/3-cupfuls onto the prepared baking sheet; our scone and muffin scoop works well here. Bake the scones for 15 to 18 minutes, until golden. Remove the scones from the oven and transfer them to a rack to cool for 5 to 10 minutes. To make the glaze: Combine the liqueur and butterscotch chips in a microwave-safe bowl and microwave on high heat for 30 seconds. Stir until smooth. Drizzle the glaze over the warm scones. Serve warm or at room temperature. Don't have cappuccino chips on hand? Leave them out of the scones; and make the glaze by combining 3/4 cup confectioners' sugar with 1 to 2 tablespoons Irish cream liqueur. Went ahead and made these with all WWW before receiving your reply and you were right. They were drier than they should have been but soooo delicious that I can't wait to make them again following your advice about the extra liquid. Thanks so much! 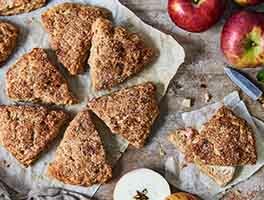 Would subbing two cups of KA white whole wheat flour work here? I made this with the confectioner's sugar/ irish cream version of the icing. A bit sweet for my personal taste, but soft and very good. Easy to make. Did not use the chips and the girls loved them. A great addition to the St Pattys menu. I've made this recipe in the past with the cappuccino chips - love it!. When KA stopped carrying the chips, I searched online and found Bailey's Irish Cream Semi-Sweet Chocolate chips. I will try them in the recipe tomorrow. Has anyone tried the Bailey's Irish Cream chips? If yes, please share your thoughts before I bake these and enter them in a baking contest at work. Thank you. These are UhMazing and must be made with Cappuccino Chips (as originally called for)- just found them on Amazon to replenish the stock I keep in my freezer YAY!!! 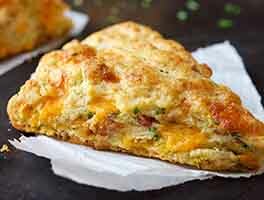 Really great tasty scones. Lol yes it was Cappacino chip and because they are difficult to find, I make my own with instant coffee and chocolet chips. Thank you for the original recipe. I could have sworn when I first read this recipe it called for cappuccino chips, but now it's butterscotch... so I did both. Butterscotch chips in the scones, and cappuccino chips for the glaze. I think next time I will try with all cappuccino. 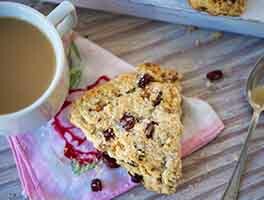 These scones are delicious though, especially when paired with coffe with a splash of baileys for breakfast! I was very excited when I found this recipe because St. Patrick's Day coming around the corner. I made this for a friends birthday get together and living in the Midwest I don't have access to the Irish flour or the cappuccino chips. So this is what I did. 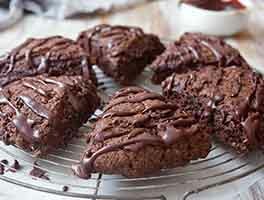 I followed the recipe exactly except I used King Arthur's whole wheat flour and I substituted the cappuccino chips with cinnamon chips. I also had to add a little bit more liquid which I chose cream to make the dough pliable. I did make it into one flat round on top of parchment paper and took my pizza cutter and cut it into triangles, I believe eight of them. I baked them until golden brown and then I melted white chocolate chips with an eighth of a teaspoon of KA espresso powder and then I diluted it with more Irish cream. I drizzled it over-the-top after they had cooled. My husband came home after long day of work and I hardly could keep him away from eating the whole pan. The only thing I will do different next time is use the scoop instead of making it into a flat. I felt maybe I handled the doubt just a little bit more than it needed to be but other than that they are amazing!! I made this as written, including the wholemeal flour, cappuccino chips and Irish cream flavor. I did lower the butter to 6 T, with fine results. Since I was baking this for my knitting group, instead of scooping I made 2 flattened rounds, froze for about 15 minutes and then cut each round into 8. I then froze the cut scones and baked them in the morning. I also skipped the glaze and simply brushed with milk and sprinkled with non-melting sugar (my absolute favorite KA ingredient!) before baking. I did find the Irish cream flavor a bit over powering so next time I'll cut the cream liquor back to 1/8 and use more milk. But the scones received excellent reviews. Will definitely make again.